And presumably at other BJ’s locations, too. BJ’s Restaurant & Brewhouse was one of the first to introduce a pumpkin ale in 1996. In 2010 we perfected the recipe, winning a silver medal at the Great American Beer Festival in the Field/Pumpkin Beer category. This holiday-inspired ale is brewed with real pumpkin and lots of spices for a delicious pumpkin pie flavor. A spicy finish balances this fresh, flavorful ale’s sweet start, while a combination of specialty malts adds a beautiful orange hue. 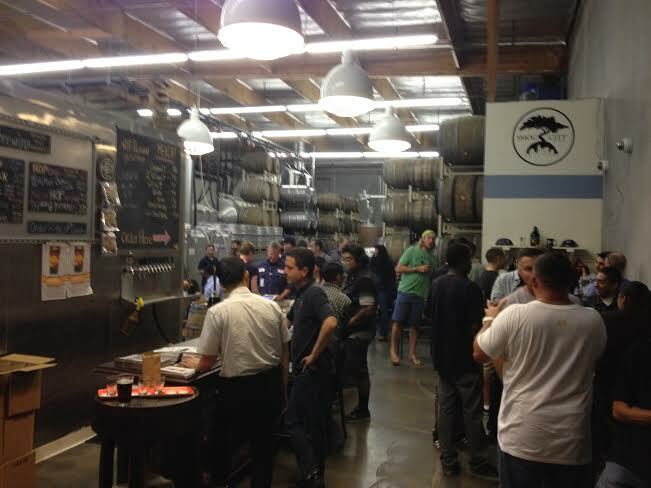 Torrance’s Smog City Brewery, left, is among the South Bay breweries hauling out limited edition specialty beers this weekend as LABW6 reaches its climax. 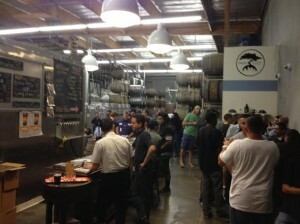 The Inland Empire has been exploding with new breweries the past couple of years and Saturday’s your chance to sample from most of them, all in one place. 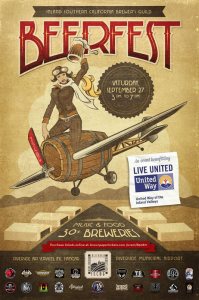 That’s because the Inland Southern California Brewer’s Guild — a coalition of Inland Empire-based breweries — is hosting its first beerfest Saturday (September 27) at Riverside Municipal Airport. 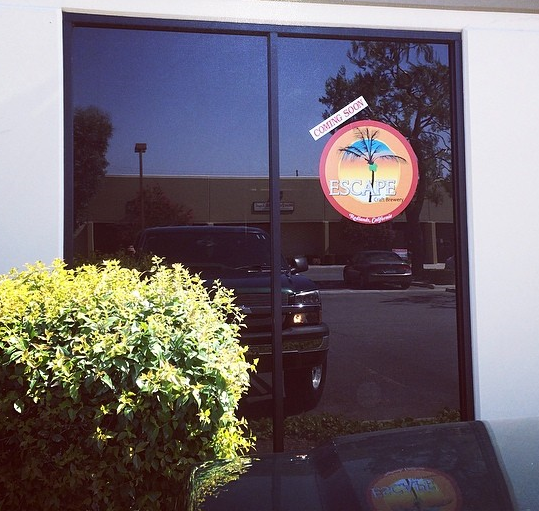 The event will take place from 3 to 7 p.m. in the Riverside Air Service, Inc. hangar at 6741 Gemende Dr.
More than 30 breweries are expected to participate, including 21 from the Inland Empire. We’ve been anticipating the opening of No Clue Craft Brewery for some time now, and it’s finally here. The brewery, Rancho Cucamonga’s second, will open at 1 p.m. today (September 20). Tasting room hours are 1 to 6 p.m. Sunday, 3 to 9 p.m. Thursday and Friday, and 1 to 9 p.m. Saturday. No Clue Craft Brewery is at 9037 Arrow Route #170. “The ultimate California Oktoberfest festival” goes from noon to 10 p.m. Sunday at Angel City Brewery. Food from Schreiner Fine Sausages, including sausage and kraut boats, apple strudel, cheese dip and potato salad. 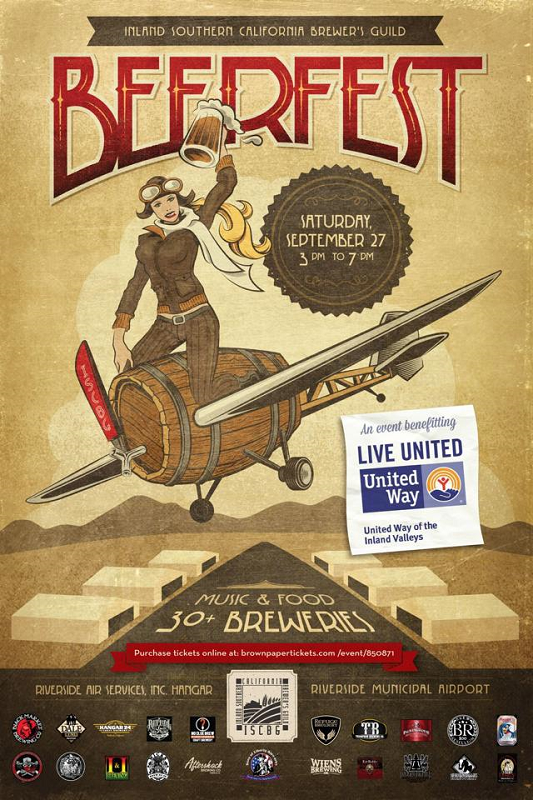 A variety of Oktoberfest themed competitions including keg rages, sauerkraut eating, stein races, and mug hoisting. Each event winner receives a stein and $25 Angel City gift card. 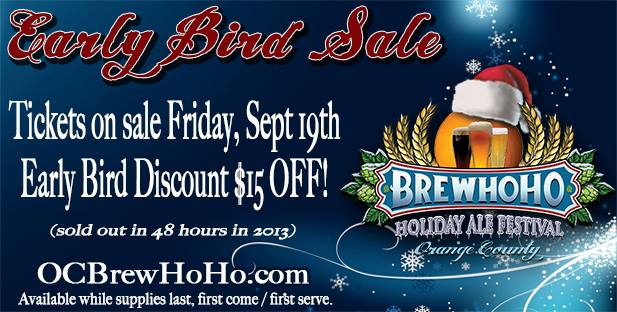 Early bird tickets for the OC BrewHoHo will go on sale beginning at 9 a.m. Friday (September 19). A limited number of early bird tickets will be available at a $15 discount over the regular price of $55. 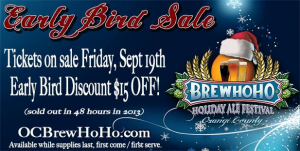 The festival will feature unlimited two-ounce samples of special seasonal, holiday and winter ales. It’ll be held from noon to 4 p.m. December 13 at the Phoenix Club, 1340 S. Sanderson Ave, Anaheim. Josh and Melissa Fisher, owners of Redlands’ soon-to-open fourth brewery, Escape Craft Brewery, are using Kickstarter to raise funds for additional supplies for the brewery. Perks for donating to the business’ startup range from stickers for a $5 contribution, to hats, T-shirts, bottle openers and stainless steel growlers for larger pledges. Contribute even more and you could leave a legacy in the brewery such as naming a fermenter (for $200) or have your own table for two, plus other gifts, in the brewery for two years for a donation of $1,000. Check out the list of Southern California locations celebrating Oktoberfest. 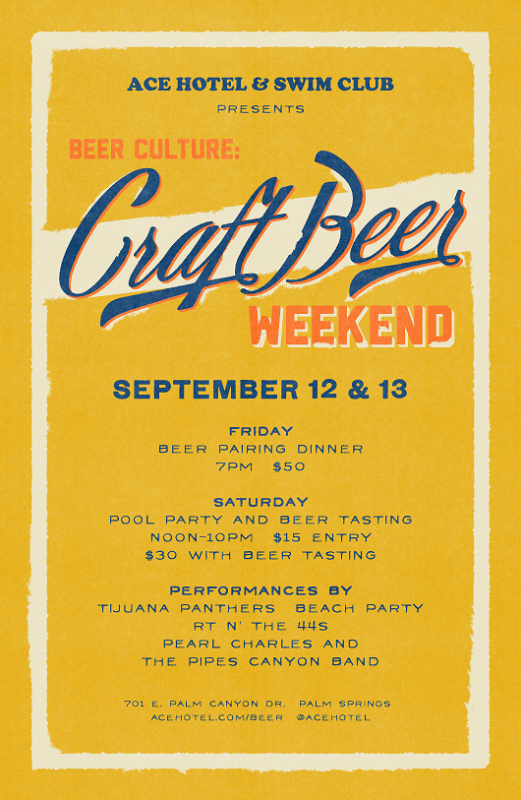 This weekend is the third annual Beer Culture: Craft Beer Weekend at the Ace Hotel & Swim Club in Palm Springs. The event kicks off at 7 p.m. tonight (September 12) with a four-course beer pairing dinner. 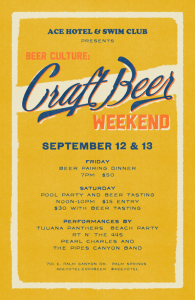 On Saturday (September 13), the hotel is throwing a pool party and beer tasting event. More than 20 breweries are expected to participate, including three Coachella Valley breweries: Babe’s Brewhouse, La Quinta Brewing Co. and Coachella Valley Brewing Company. 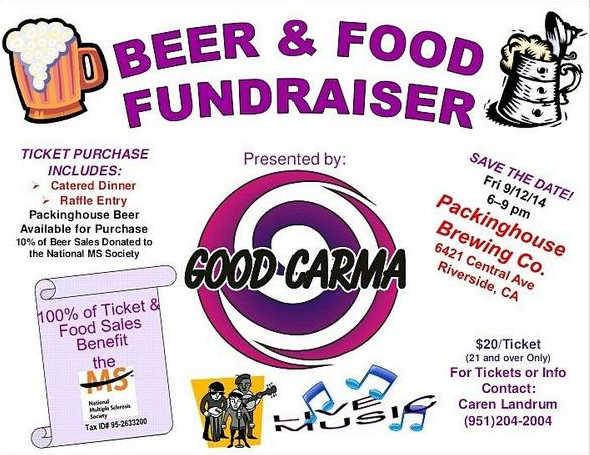 Riverside’s Packinghouse Brewing Company’s “Good Carma” fundraiser Friday (September 12) will benefit the National Multiple Sclerosis Society. All the money received for a dinner catered by Chef Shawn Wood of Partners Pantry will be donated to the organization. 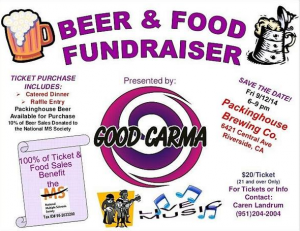 Tickets for the dinner are $20 and include a raffle ticket for a gift certificate for Skydive Perris Indoor Skydiving.